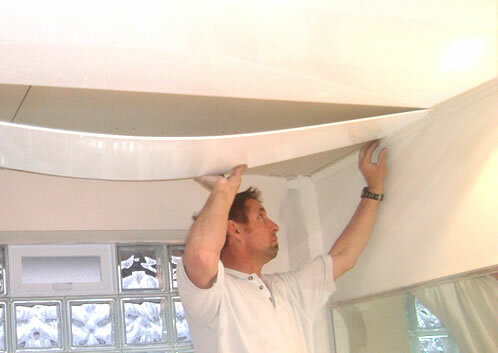 Measure ceiling and cut panels and CORNICE to size with a fine tooth saw. Cut holes for plumbing fittings with a utility knife or hole saw. Use PVC friendly Selley's Roof and Gutter Sealant as a glue for secure fixing to plaster or timber frame. Its a good idea to secret nail or staple in random spacing through the back of the panel lugs to secure panels whilst the glue is setting. To fit last panel into the CORNICE, cut 6mm from the panel width. Then place the CORNICE already on the panel before putting it to the ceiling and glue it all (panel + CORNICE) to the ceiling. For a totally waterproof seal use mould resistant silicone sealant (eg Selley's Roof & Gutter Sealant) in all joints and channels during assembly. Run a continuous bead of silicone down the back lug of each panel. This will provide secure leak proof and mould free joins. For panel adhesive use a glue who’s manufacturer has approved the product compatible with PVC panel and wall substrate. Selley's Roof & Gutter Sealant when used as a glue is also the most effective. It is recommended that PANELSCAPE is not installed in front of or next to a fireplace or hot cooking appliances otherwise distortion may occur. Do not use outside, except for eave lining. To clean use a damp cloth. Do not use abrasive detergents.